We last updated the numbers back in April 2010, but since I’m thinking about it, here’s where we are now. I moved a few other things from “Miscellaneous” into authored categories, but the overall quotations made a very nice increase over the last year (if I’d waited until the end of April, I’d be a full thousand more quotes). I’ve also added a good number of new authors. Speaking of authors, here’s the current Top 10 (expanded a bit, due to ties). The ones in italics have jumped into the list since last year. There’s now a listing in the sidebar (“Prolific Authors”) to show this info dynamically. 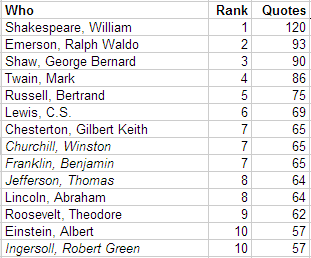 I’ve noted where each quote has risen or fallen in the rankings, or is new in the Top 10 from last time (♥). Quotes that fell off were Robert Louis Stevenson (“Aes Triplex” (1878)), William Henley (“Invictus” (1875)), and Patrick Henry (Speech, Virginia Ratifying Convention (5 Jun 1788)). As far as traffic goes, according to Google Analytics I averaged about 107 visits a day in the last month, which looks to be up from the previous period, averaging around a thousand page views a week. Not too shabby — hardly fortune and glory, but a nice validation for my hobby.